A stay at Red Lion Hotel Orlando - Kissimmee Maingate places you in the heart of Kissimmee, within a 10-minute drive of Disney's Fantasia Gardens Miniature Golf Course and Disney's Winter Summerland Miniature Golf Course. This family-friendly hotel is 3.9 mi (6.3 km) from Disney's Blizzard Beach Water Park and 4 mi (6.5 km) from ESPN Wide World of Sports. Make yourself at home in one of the 516 air-conditioned rooms featuring refrigerators and iPod docking stations. 32-inch flat-screen televisions with cable programming provide entertainment, while complimentary wireless Internet access keeps you connected. Private bathrooms with shower/tub combinations feature designer toiletries and hair dryers. Conveniences include safes and desks, as well as phones with free local calls. Dip into one of the 4 outdoor swimming pools or enjoy other recreational amenities including an outdoor tennis court and a fitness center. Additional features at this hotel include complimentary wireless Internet access, concierge services, and an arcade/game room. If you're planning a day at a nearby theme park, you can hop on the complimentary shuttle. Satisfy your appetite at Red's Bar andGrill, one of the hotel's 2 restaurants. Wrap up your day with a drink at the bar/lounge. Buffet breakfasts are available daily from 7:00 AM to 11:00 AM for a fee. 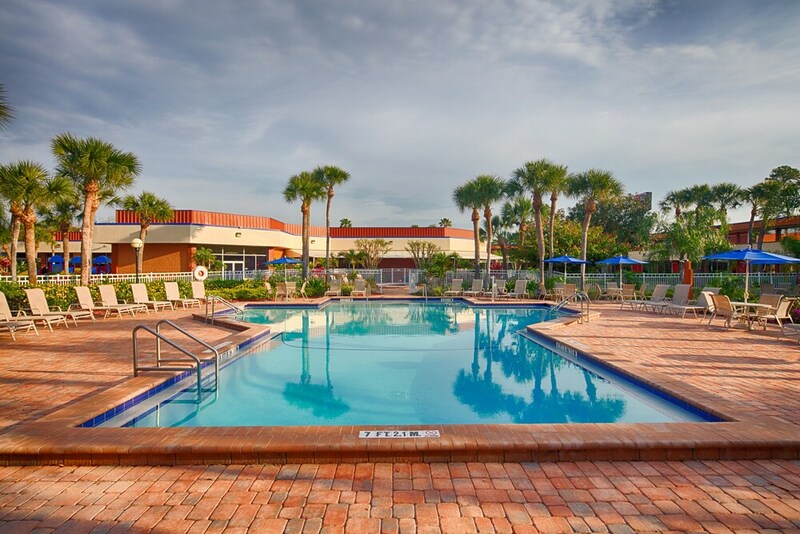 Red Lion Hotel Orlando - Kissimmee Maingate features 4 outdoor swimming pools, an outdoor tennis court, a fitness center, and a children's pool. Dining is available at one of the hotel's 2 restaurants. A bar/lounge is on site where guests can unwind with a drink. Public areas are equipped with complimentary wireless Internet access. This 3-star property offers access to a business center. This family-friendly hotel also offers tour/ticket assistance, barbecue grills, and an arcade/game room. For a surcharge, an area shuttle within 10.00 mi is available to guests. Complimentary self parking is available on site. Red Lion Hotel Orlando - Kissimmee Maingate is a smoke-free property. Red's Bar andGrill - This restaurant serves dinner only. Guests can enjoy drinks at the bar. A children's menu is available. Happy hour is offered. Open select days. Pizza Hut Express - Onsite family restaurant. Open daily. An outdoor tennis court and complimentary bicycles are featured at the hotel. 4 outdoor swimming pools are on site along with a children's pool. Other recreational amenities include a fitness center. Guests should be aware that 1 dog resides at this property. For more details, please contact the property using the information on the reservation confirmation received after booking. Pool access available from 6 AM to 10 PM.The property has connecting/adjoining rooms, which are subject to availability and can be requested by contacting the property using the number on the booking confirmation. The property allows pets in specific rooms only and has other pet restrictions (surcharges apply and can be found in the Fees section). Guests can arrange to bring pets by contacting the property directly, using the contact information on the booking confirmation.